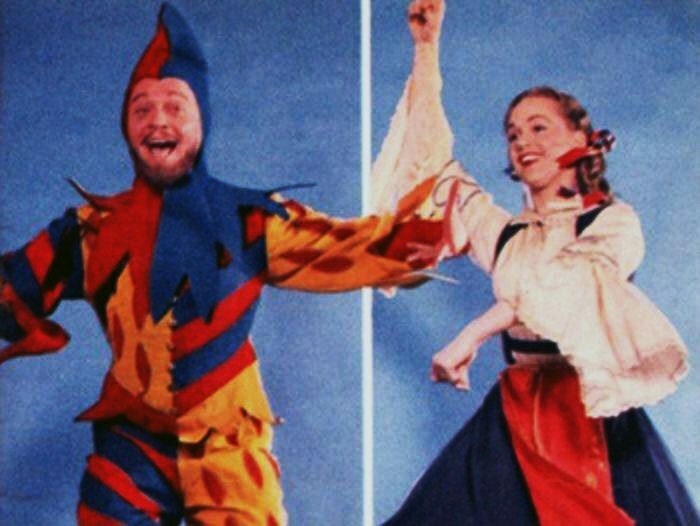 “I have a song to sing,” carols Alfred Drake in the TV Production of “Yeoman Of The Guard“; “Sing me your song” counters a young Barbara Cook, at the dawn of her esteemed career. In addition, this 1957 “Hallmark Hall Of Fame” offering features a starry ensemble that includes Celeste Holm (to whom the DVD is dedicated,) Bill Hayes, Robert Wright and Henry Calvin. The time is 400 hundred years ago and the place is the infamous Tower of London. “Beauchamp Tower, Bloody Tower, Traitors Gate–they have the ring of history and tragedy!” we’re told in the opening narration; “Within these walls queens, philosophers and common conspirators have spent their last days.” Told in two acts, Hayes plays the dashing Colonel Fairfax around whom the story revolves. Celeste Holm is Phoebe Meryll–the Tower-keeper’s daughter, who is deeply smitten with the Colonel, despite his being scheduled for beheading on a trumped-up charge. ”This wicked tower must be fed with the best and bravest blood in England!” she seethes: thus, concocting a scheme to save him from his appointment with the chopping block, her plan calls for disguising Fairfax as her brother–a recently appointed “Yeoman” of the Tower Guard. Meanwhile, the Colonel, who wishes to marry (no matter to who) in order to keep his corrupt kinsmen from inheriting his estate (as would happen were he to die a bachelor,) asks his friend Lt. Cholmondeley to find him a ready bride. Enter Jack Point and his gal, Elsie (–the “Merry Man and the Maid” of the alternate title.) Drake is Jack–a professional “fool”, Jester and our narrator while Elsie is dynamically played by Cook. “Fickle destiny sets the stage” when, being promised immediate widowhood, Elsie agrees to marry Fairfax for 100 Crowns–the catch? She must be blindfolded. (This, incidentally, also means Fairfax can’t see her face either!) Greatly aiding the overall translation to the small-screen was the “masterful” direction by George Schaefer and “rich musical direction“ by Franz Allers. 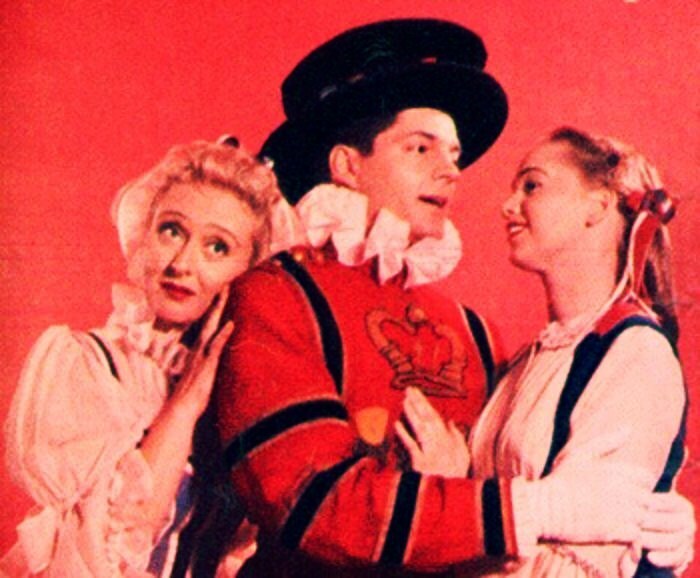 “Yeoman” may not be the most known of Gilbert and Sullivan’s works, but the score is tuneful and many songs will definitely be playing pleasantly in your head long after the DVD has ended. One particular latter half highlight involves an amazing four-part harmony titled “Strange Adventure This”. Performed a capela between Fairfax, Phoebe’s father, his housekeeper and her niece, through it the disguised Colonel at last realizes it is Elsie whom he earlier married. Nonetheless, the story’s ending sees Jack heart-broken and two other couples regrettably promised. In fact, the only satisfied ones seem to be Fairfax, his ‘wife’ Elsie and Wilfred– the oafish jailer, who at least has the promise of marriage from his desired Phoebe. The obvious moral is that falsehoods told (regardless of how lofty the reasons for them) are always wrong, and may just bring about their own punishments! Yet, as farces go, “happy” ending or otherwise, this is among the best plots ever conceived by Sirs Gilbert and Sullivan or anybody else! Similarly, there’s the celebrated staging of “The Mikado” (a.k.a. 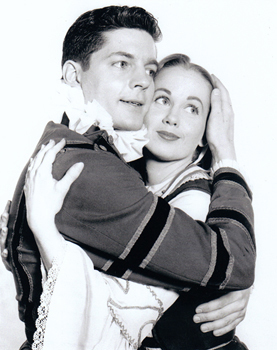 “The Town Of Titipu”) initially broadcast in April 1960 as the finale to “The Bell Telephone Hour‘s” 20th season (the show having begun as a hit radio program.) 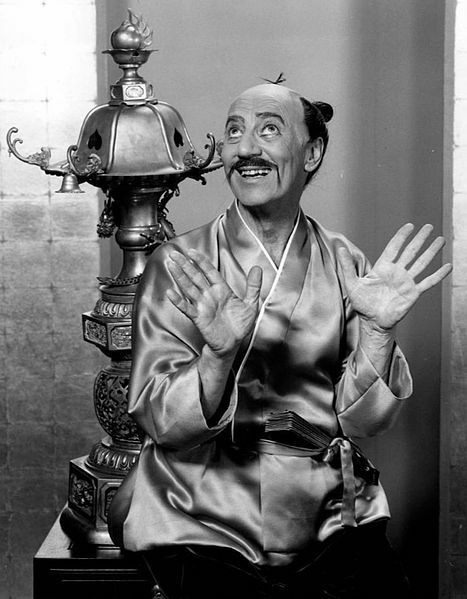 Billed as a “Topsy-Turvy” tale of love and intrigue, it stars legendary comic, Groucho Marx. That’s right–Groucho, one of the Comic Giants of the 20th Century is Ko-Ko, a hapless tailor who, we learn, has recently been ‘elevated” to the position of “Lord High Executioner”. His pretty young ward is called “Yum-Yum”. As the story opens, Nanki-Poo, the son of Japan’s royal “Mikado“, arrives in their small village disguised as a “wandering minstrel“(–he ,“a thing of shreds and patches”) looking for the girl, whom he first fell in love with while playing second trombone in a strolling orchestra. Complicating Nanki-Poo’s already fine “How-De-Do” is that he has fled his father’s court after a disagreeable older lady named Katisha (–of whom it is later observed, “has a caricature for a face!”) mistook his “customary affability” for a proposal of marriage (“I am an acquired taste” she huffs.) The “Mikado” of the title doesn’t actually appear until the third act and, along with that “Daughter-In-Law-Elect“, confesses that the real purpose of his visit is to find his missing son whom he mistakenly believes Ko-Ko has executed. Immediately he commands that killing the royal heir calls for a horrible death. 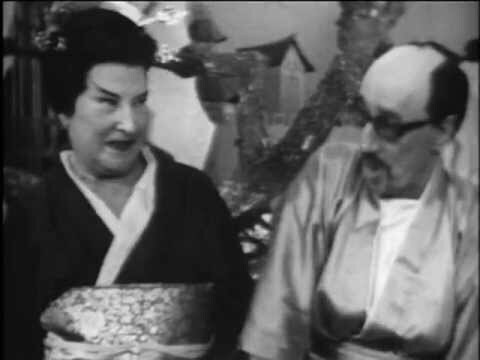 ( “I’m very sorry,” he declares, “but virtue only triumphs in Theatrical Productions!”) Just when things look the darkest, Nanki-Poo (having just eloped with Yum-Yum,) secretly comes out of hiding to urge Ko-Ko to marry Katisha, after which he can reveal himself as alive and spoken for, thus no one will be killed. Although initially less than enthusiastic, the Tailor/Executioner agrees, where upon Katisha coquettishly asks her new ‘intended’, “You won’t hate me if I’m a teeny-weeny-WEEEENY bit bloodthirsty?“; “In you dear Katisha, is there not beauty even in bloodthirstiness?“ he replies. Likewise, Stanley Holloway is Pooh-Bah, the “Lord High Everything Else” (because all other great officers of state, being too proud to serve under an ex-tailor like Ko-Ko, resigned, at which time he accepted all of their posts!) “I am in point-of -fact, a particularly haughty and exclusive person,” he declares, “I was born sneering!” Holloway’s understated, but consistently uproarious performance is yet another reason this production was so incredible. Yet, if there was one performer who could steal the spotlight from a ‘Clown-Prince’ like Groucho, it’s Opera’s Grande-Dame, Helen Traubel as “Katisha”. “My face is unattractive” she rebukes Pooh-Bah upon an attempt to falsely compliment her; “but my left elbow has a fascination few can resist!” That Traubel possessed a superior singing voice was obvious; that she was also gifted with extraordinary comic abilities as well is a wonderful surprise. When Ko-Ko suddenly finds himself engaged to her, the pair provide still another not-to-be-missed moment with ‘“There Is Beauty In The Bellow Of The Blast”. Throughout, it’s obvious they’re having so much fun playing opposite one another that viewers cannot help but enjoy it even more! 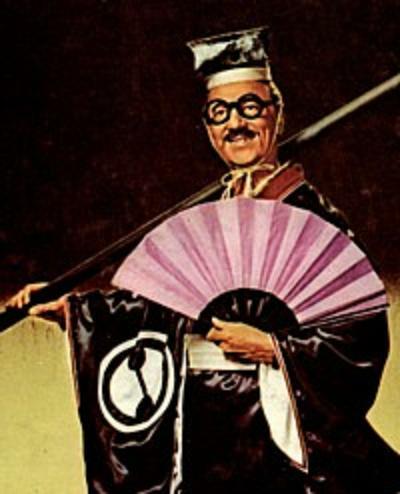 “The Mikado” is a brilliant and raucously funny comic-masterpiece meant to be enjoyed as such; it’s also delightfully apparent that the producers here put the humor first, making it more accessible and remarkable! Consider also how the laughs this piece is loaded with really aren’t so different from the kind of off-the-wall buffoonery the Marx Brothers were famous for (Groucho even plays the role with his famous glasses!) Perhaps most noteworthy though, is the more you watch it, the more you’re likely to realize just what a technical and artistic triumph it was for everyone involved. Special Thanks To Foster Grimm And The Staff Of V.A.I.Music For Their Kind Assistance & Patience In Making This Story Possible. This entry was posted in DVD Reviews and tagged "The Merry Man And The Maid", "The Town Of Titipu", Alfred Drake, Barbara Cook, Barbara Meister, Bell Telephone Hour, Bill Hayes, Celeste Holm, Franz Allers, Gilbert & Sullivan, Golden Age Of Television, Groucho Marx, Hallmark Hall Of Fame, Helen Traubel, Katisha, Lord High Executioner, Martyn Geen, Melinda Marx, Operettas, Robert Rounseville, Sir Arthur Sullivan, Sir William S.Gilbert, Stanley Holloway, Strange Adventure This, Televised Musicals, The Mikado, The Yeoman Of The Guard, Three Little Maids, Tower Of London, V.A.I. Music, Video Artists International. Bookmark the permalink.